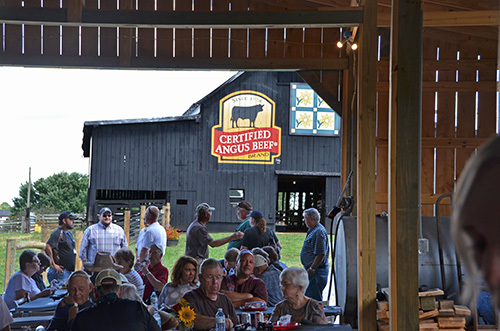 The Certified Angus Beef® Brand is celebrating their 40th Anniversary this year. 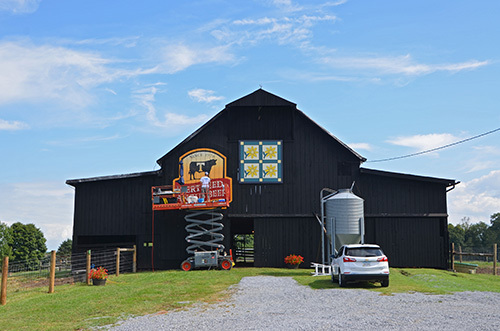 One of the things they are doing is a Brand The Barn campaign in which, they are painting their logo on 40 barns in 25 states across the country. 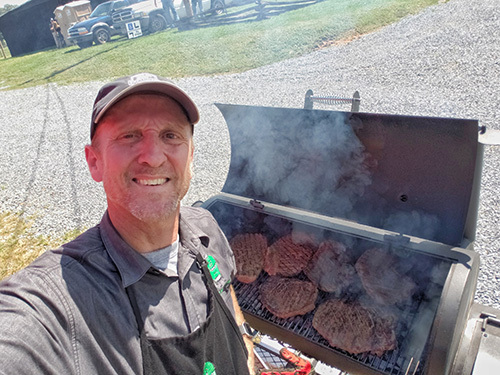 Last week, Alexis and I were honored to cater the lunch for 100 people at the 33rd barn painting of the year at Wincrest Angus up in Johnson City, Tennessee. We arrived at dawn on a lightly foggy morning. Owner, Sam Widener was already there working. He welcomed us and got us set up so we could get cooking early. It was only Alexis and me cooking, so we had a lot to get done. We would have liked to have just brought the truck; however, there was a high percentage chance for rain, so we brought the trailer along to be on the safe side. It didn't rain, but it was nice to have the air conditioning. Set up and ready to roll. 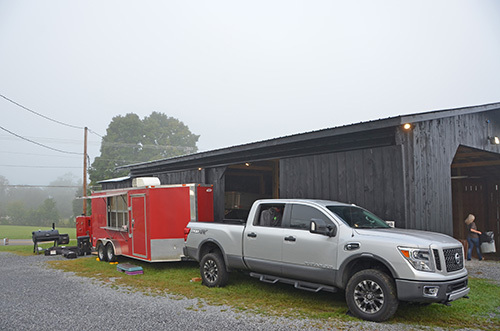 We brought one of our offset smokers to use as a grill and our big gravity fed Deep South. 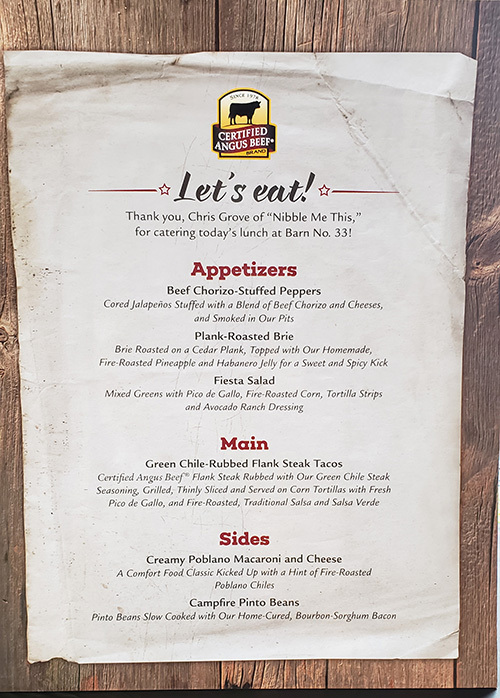 Here is the menu that we put together with the people at Certified Angus Beef® Brand. 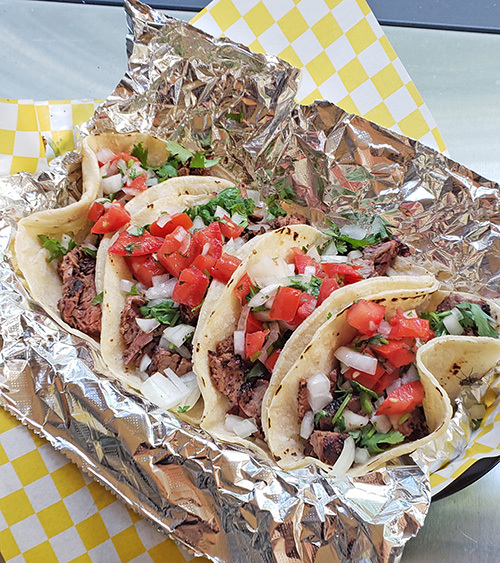 It was centered around our Green Chile Crusted Flank Steak Tacos. Quantities Plan - Start with the menu and figure out exactly how much we need of each item based on head counts. Shopping List - Use the Quantities Plan to detail what supplies and food we need to buy. Tasks List - We take each menu item and break it down into the individual tasks and put those into a to-do list organized by day. Cooking Plan - We decide what, when, and how we will prepare each menu item so we know what equipment to bring. Transportation Plan - Writing down how we will get food items there, keeping ready-to-eat apart from raw and hot apart from cold. This involves using hot-boxes and coolers. Serving Plan - This is a layout of our buffet service, so we know how many tables, chaffing dishes, and utensils we need. Prep work started 4 days before the event. 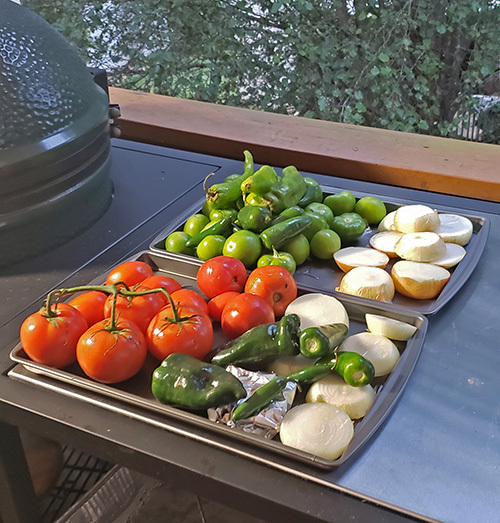 We kicked things off by making fire-roasted salsas for the flank steak tacos. We made a few batches of our garden salsa and salsa verde. The artist doing these paintings is Troy Freeman of Free Sky Studios. 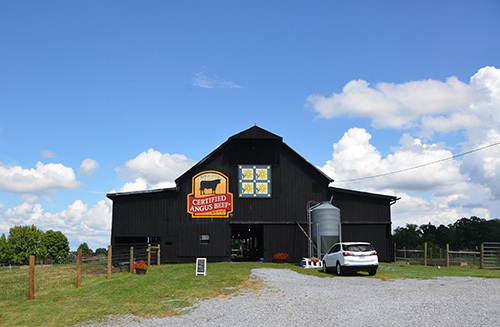 Notice that the black Angus bull is sporting the "Power T" at this point. Unfortunately, that was just for while he was painting. At the end he filled it in because of trademark issues but it was cut while it lasted. I brought one of my Oklahoma Joe offset smokers to use as a grill. Usually, I only use those as smokers but this time I had a case of flank steaks and I needed the real estate for grilling. 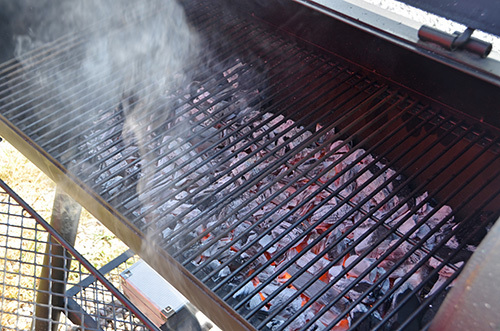 I put charcoal grates in the cooking chamber, loaded them with a bag of lump charcoal and fired the whole thing up. Holy smokes it was hot but that's what I needed. We had dry brined the flank steaks with our Green Chile Steak Seasoning overnight. I seared them for 8-10 minutes depending on thickness. The forecast had been for likely rain but instead, we had a hot and beautiful day at Wincrest Angus. Alexis and I do our primary grocery shopping at Food City. 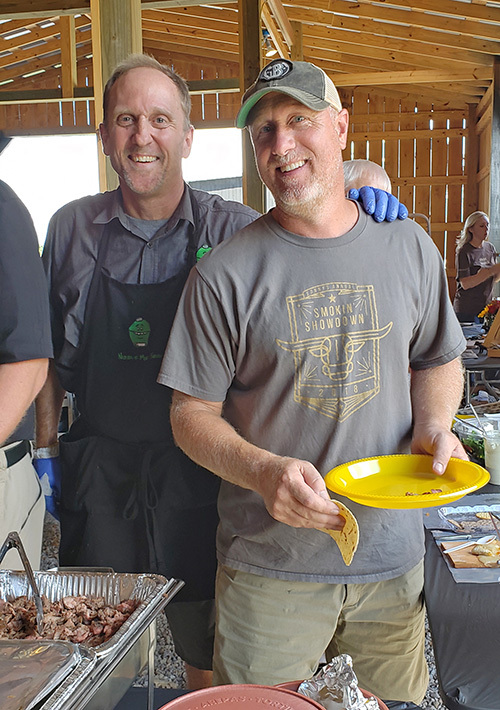 We were glad to have Steve Holloway, Food City's Director of Meat and Seafood attend the event with a cadre of folks from Food City. The turnout was fantastic. We ended up serving 115 plates, fortunately, we always plan for extra. 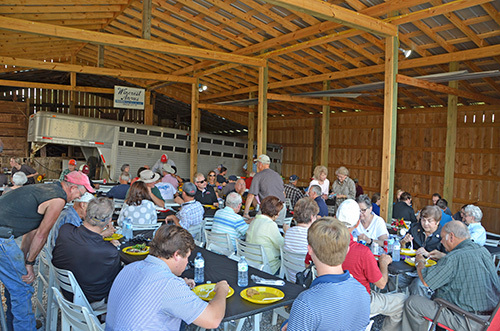 Dining was set up in one of the secondary barns. It was quite a celebration with everyone eating, laughing, and talking. Walt Moulton, pitmaster of the Rocky Top BBQ competition team, came by. Turns out he is great friends with Chris Widener at the farm. Walt is a BBQ World Champion because he won the Jack Daniels Invitational last year. He headed out to Salisbury NC this past weekend and won Grand Champion there as well. The man knows way more about BBQ than I do so I was thrilled to see him get seconds. It was a lot of work, but Alexis and I were glad to feed everyone. What does it take to raise cattle that qualify for the Certified Angus Beef® Brand? 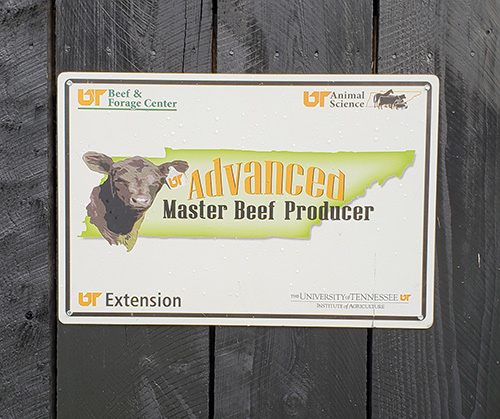 Wincrest Angus has been designated by the University of Tennessee as an Advanced Master Beef Producer. 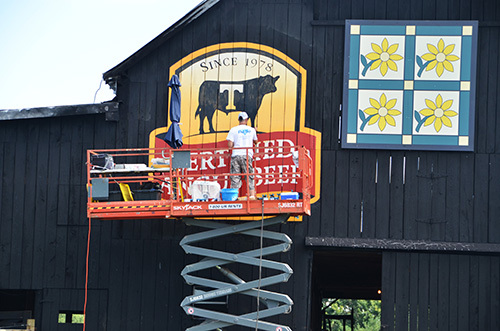 Barn painting advertising has been around since the 1890s. The example that comes to mind for me is the "See Rock City" advertisements that were painted on over 900 barns in 19 states [source]. Since the interstate systems were built and American's quit traveling country roads as much, these pieces of Americana has been disappearing. 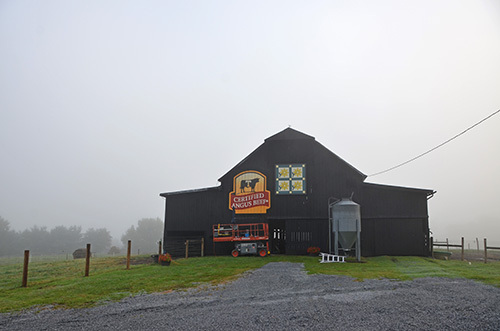 The few remaining barn advertisements, faded and flaking, are ghosts of a bygone era. So I'm glad that the Certified Angus Beef® Brand has taken up this initiative and we were glad to be a part of it. For more about the Brand The Barn campaign, check out the Certified Angus Beef® Brand's website and follow #BrandTheBarn on social media.